Dayze Gone Bye offers carriage and sleigh rides for all occasions. BELLEVILLE — Take a short trip over the mountains and you’ll find yourself in Belleville, a quaint town with a well-known weekly auction and farmer’s market attended by Amish families from throughout central Pennsylvania. Eight miles west — in “Big Valley”— you’ll find Allensville, a farming community that is home to dozens of Amish families that maintain a way of life that feels more like 1812 than 2012. In that verdant region you’ll also find “Dayze Gone Bye,” a company that offers carriage rides for all occasions, from hay rides to sleigh rides. Owned and operated by Nick and Tara Richtscheit, “Dayze Gone Bye” has a signature offering that is the experience of a lifetime: a guided tour through the back roads of Amish country in a genuine Amish buggy. What makes the experience so unique, and so fascinating, is the narrative that the Richtscheit’s offer as you make your way for several miles through farms and homesteads that you might never get to see otherwise. Even more enchanting, though, is the fact that both husband and wife are very friendly with their neighbors. Before they created their company, they asked the local Amish community for its blessing. Nick served as the Chief of Police in Houtzdale for 30 years. Tara worked for Berg Electronics in Clearfield for 27 years. When their careers ended, the couple decided to move to Allensville. To ensure that their business does not intrude on the Amish community, the Richtscheit’s are very respectful of Amish culture and beliefs. For example, they do not allow their passengers to photograph the Amish residents. Amish culture believes that photographing a person’s face is akin to stealing an individual’s soul. “We asked our Amish neighbors if they thought our buggy rides would be disrespectful. We always talk to our neighbors. We are also part of the community,” said Tara. The Richtscheit’s are members of the local Mennonite church. The tours of the Amish countryside are personalized so that each rider gets to experience something different. The buggy stops along the way to allow passengers to shop at “stores” set up on many farms. Fresh produce, eggs, meats, cheese and other goods are available, depending upon the season. Riders can also meet Amish furniture and shoe makers along the route. 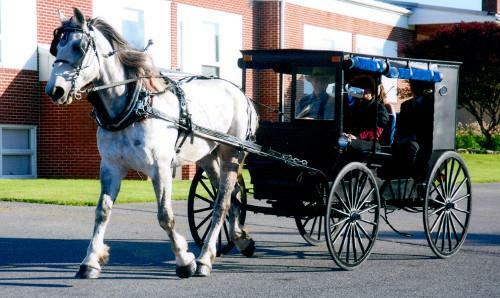 In addition to Amish country tours, “Dayze Gone Bye” offers many other services including hay rides, special events — such as anniversaries and weddings — sleigh rides and parades. They are able to transport their horses and carriages to any location. “We do many events,” says Tara. “Oktoberfest in Cassville, Harvest Fest in Reedsville, May Fest in Huntingdon, Krist Kindle Fest in Mifflinburg and the Gita Nagari celebration in Port Royale.” The Richtscheit’s believe that they can make any special occasion even more special. From Proms to proposals and weddings, they are ready to serve. Of course, it is the experience of clip-clopping through the back lanes of Big Valley that should not be missed. Visit “Dayze Gone Bye” on their website, www.dayzegonebye.com or call (814) 553-5149. Harry is a correspondent for the Gazette.